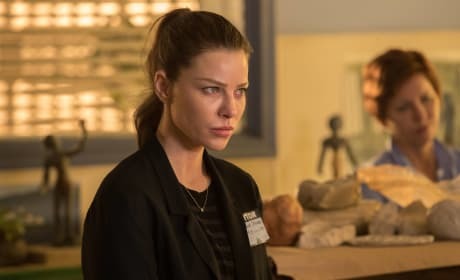 Chloe looks thrilled to be the center of Lucifer's universe right now. How did he convince her to sit for a portrait? 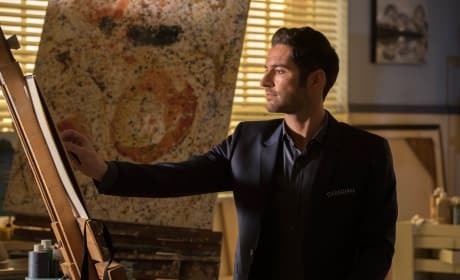 Lucifer is taking his painting quite seriously. Will he capture the essence of Chloe or will it be more of an abstract piece of art? Maybe a stick figure? 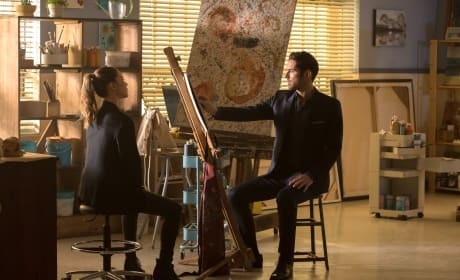 Lucifer looks to be painting a portrait of Chloe. Is he going to hang it up at the Lux when he's finished? 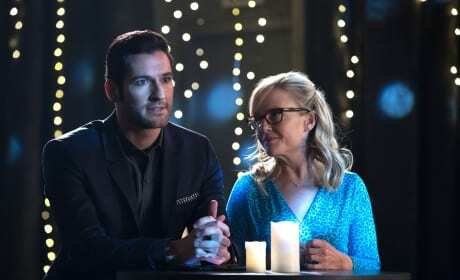 Lucifer and Dr. Linda are enjoying each other's company. It's good to see she made it out of the insane asylum in one piece! 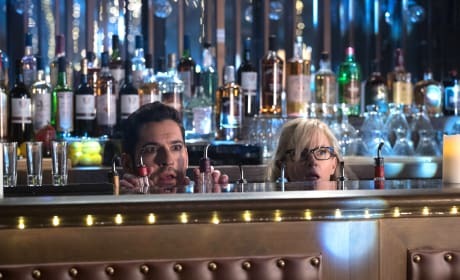 Lucifer and Dr. Linda look like they're playing a game of hide-and-seek. Who are they playing with, and why are they being so goofy? Charlotte looks like the goddess she is in this dress. The glowing lights behind her make it even more so. But she certainly doesn't look very happy. Has she met God Johnson? 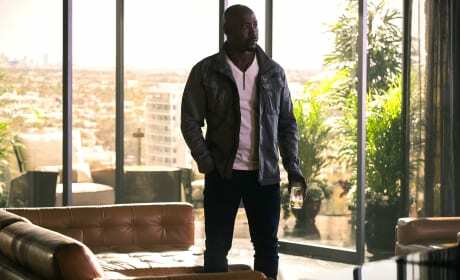 We all know how crazy Amenadiel can get when he drinks, but he doesn't look like he's having too much fun right now. 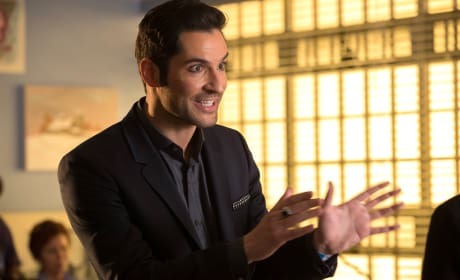 What on earth could he and Lucifer be discussing? 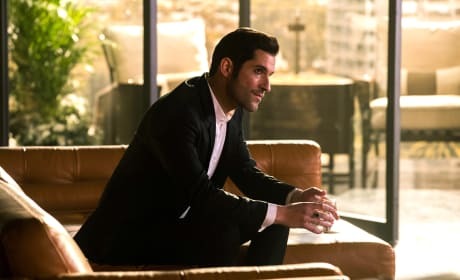 Lucifer is relaxing back at his penthouse with a drink in hand. He looks to be contemplating some great mystery. Is he thinking about Chloe or is there something else on his mind? Lucifer is super excited about something. 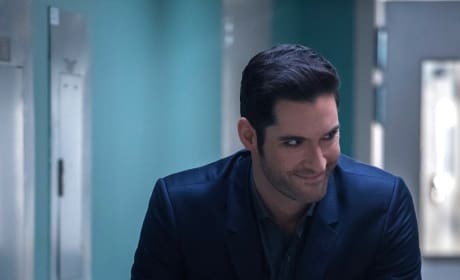 Has he helped Chloe solve the case or is he just happy to be back on cases with her? Chloe is undercover on a case. One of her strengths is going undercover. She usually gets the information she needs. Will she succeed this time? It looks like Lucifer's charms didn't work as well as he hoped on this guy. Did he not get the information he was looking for? 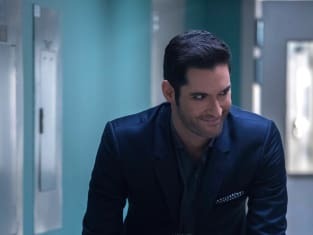 Lucifer is wheeling Dr. Linda down a hallway. Is she pretending to be a mental patient? If she ever told anyone the truth about her clients, she very well might get admitted! 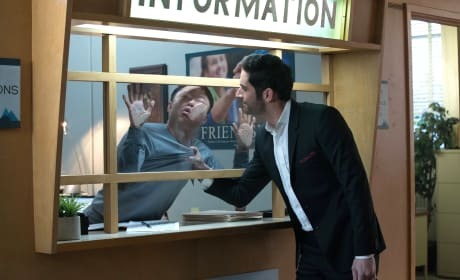 Lucifer Photo Preview: God Has Arrived!